↑ Martucci, Dave (1999). 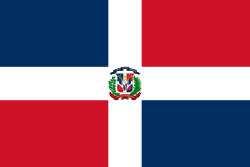 "Historical flags of the Dominican Republic". Retrieved 2007-09-20. ↑ Marcano, José. "La Bandera de la República Dominicana" (in Spanish). Retrieved 2009-06-29. This page was last changed on 8 May 2013, at 03:38.